Since its start in 1992, Earth Conservancy has worked towards environmental improvement and sustainable land reuse through numerous land use plans and reclamation projects, all of which have reflected our commitment to restoration, conservation, and responsible development. EC also supports environmental education initiatives and and community outreach activities regularly. Over the past 20 years, this work has earned EC national, state and local recognition, affirming our ongoing contributions to progress in the south Wyoming Valley. Earth Conservancy was honored to receive a 2018 Governor’s Award for Environmental Excellence for its wayside exhibit at EC’s Askam Borehole AMD Treatment System. Thanks must be shared with our partners who helped on the project – teachers Meredith Falchek and Jared Meehan and their students from Solomon-Plains Junior High School in the Wilkes-Barre Area School District, and the staff at EPCAMR. Thanks also to those entities who supported the project through grants, including the Pennsylvania Department of Environmental Protection, Luzerne County, and ARIPPA. We encourage everyone to visit the exhibit to better understand the issues of acid mine drainage in our region and EC’s attempts to mitigate it. Pictured left: Cindy Adams Dunn, Secretary of the Pennsylvania Department of Conservation and Natural Resources; Davitt Woodwell, President of the Pennsylvania Environmental Council; and Patrick McDonnell, Secretary of the Pennsylvania Department of Environmental Protection (rear); and Dr. Elizabeth W. Hughes, Director of Communications, Earth Conservancy (front). Learn more about the Askam Borehole AMD Treatment system Wayside Exhibit here. Earth Conservancy was honored to be invited by the U.S. Environmental Protection Agency to discuss its reclamation work at the 2016 WV Brownfields Conference in Charleston, West Virginia. The three-day event, hosted by the West Virginia Brownfields Assistance Center, covered all aspects of brownfields redevelopment, including planning, financing, and community engagement. EC’s presentation, given during a session on “Formerly Mined Lands” by EC’s Director of Communications, Elizabeth W. Hughes, EdD, reviewed the organization’s history, the role of land use planning in its efforts, and some of its notable accomplishments over its 20+ years. Dr. Hughes’s slideshow is available by clicking the image at left. Earth Conservancy was honored to be featured as the U.S. Environmental Protection Agency’s 2015 Brownfields Success Story. Read about our ongoing partnership with the agency for abandoned mineland reclamation by clicking the image at left. 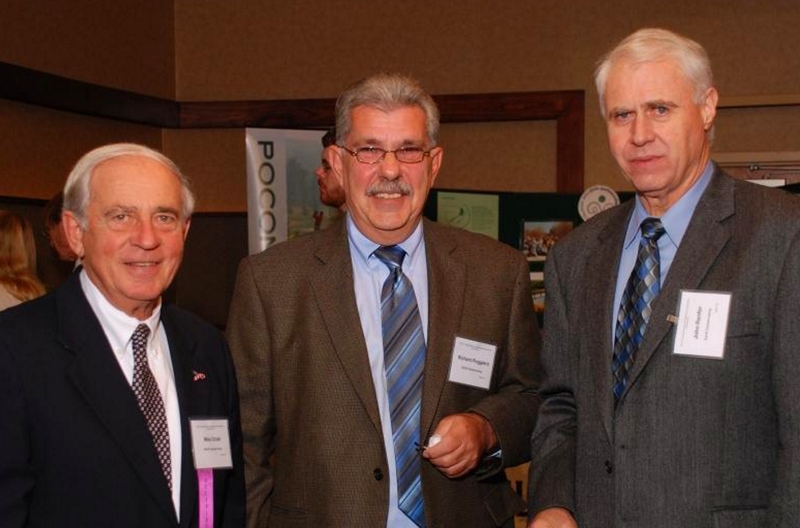 Earth Conservancy received the 2013 Governor’s Award for Environmental Excellence for its Huber IV Reclamation Project. The award, issued through Pennsylvania’s Department of Environmental Protection, recognizes entities that have engaged in work that promotes environmental stewardship and economic development in the state. 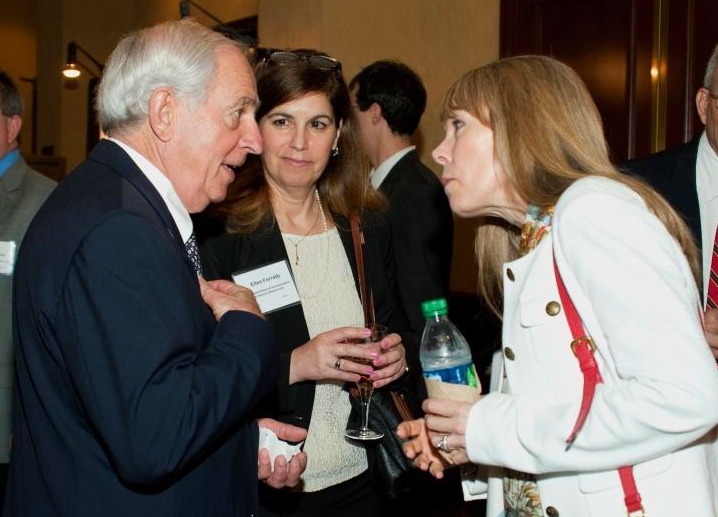 On April 17, 2013, Earth Conservancy and 15 other awardees were honored at a dinner in Harrisburg hosted by the Pennsylvania Environmental Council. Richard Allan, Secretary of Pennsylvania’s Department of Conservation and Natural Resources was the keynote speaker. This is Earth Conservancy’s sixth Governor’s award. Pictured top right, left to right: Mike Dziak, President & CEO, Earth Conservancy; Ellen Ferretti, Deputy Secretary for Parks and Forestry, DCNR; and Patricia Allan, Policy Director, DEP. Pictured top, far right, left to right: Richard Allan, Secretary, DCNR; Mike Dziak; and Christopher Abruzzo, Acting Secretary, DEP. Pictured bottom right: Award recipients from all 16 winning organizations. Earth Conservancy received the 2012 Professional Recyclers of Pennsylvania (PROP) Waste Watchers Award for its Leaf and Yard Waste Composting Facility. The facility processes organic materials primarily from Luzerne County residents and municipalities, and turns it into a nutrient-rich compost used in Earth Conservancy’s reclamation projects and its community garden. In 2011, the facility served 18 municipalities and processed 124,000 tons of material, saving users an estimated $3.1 million in landfill tipping fees. The compost is then available to residents and municipalities of Luzerne County, and EC regularly donates material to events like like the Newport Township Community Organization’s annual cleanup, and Kistler Elementary’s garden project. In addition, EC has partnered with organizations like the Chesapeake Bay Foundation and Pennsylvania American Water Company to improve its compost by incorporating organic materials from these entities. 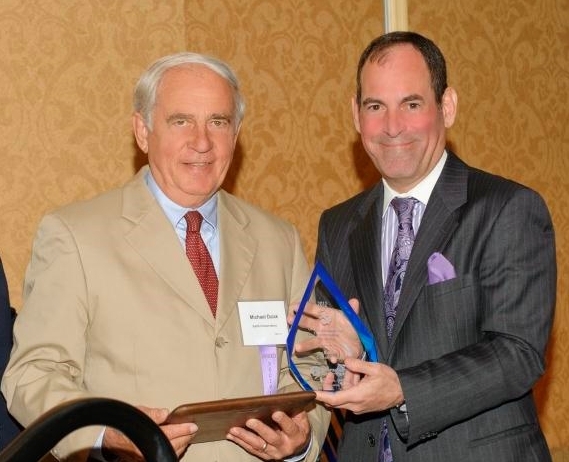 Pictured left: John Renfer, Executive Administrator, Earth Conservancy; and Robert Watts, Board President, PROP. Learn more about EC’s compost facility here. Earth Conservancy received a 2012 Governor’s Award for Environmental Excellence for the Espy Run Wetlands Enhancement Project. The project diverts AMD-contaminated water released from an underground mine seep into a treatment pond in which iron particles settle out. The cleaned water then exits back into Espy Run. The project was funded by the U.S. Environmental Protection Agency and Earth Conservancy. Pictured right: Mike Dziak, President & CEO, Earth Conservancy; and Michael Krancer, Secretary, DEP. 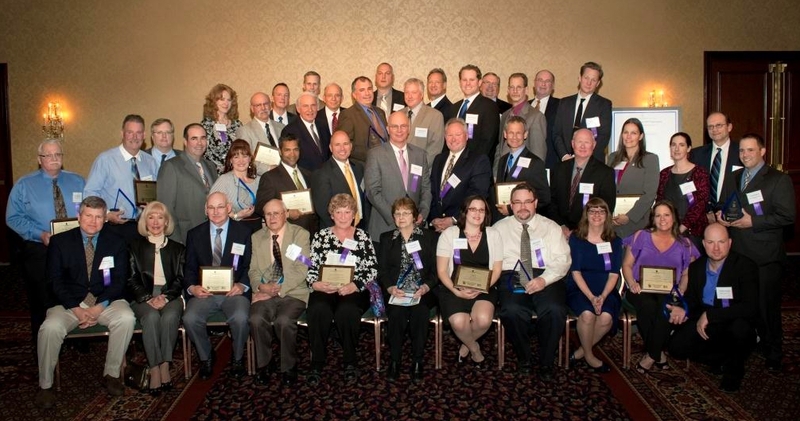 Pictured far right: All 2012 Pennsylvania Governor’s Award recipients. 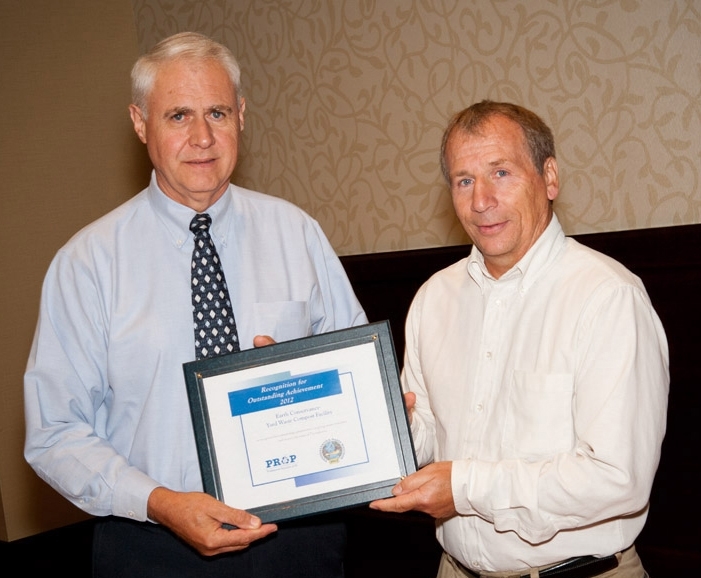 Earth Conservancy received the 2011 Environmental Partnership Award for Environmental Excellence for its Huber III reclamation project, an 80-acre mine-scarred site. Its access to S.R 29 and I-81 and location at the entrance to the Hanover Industrial Estates’ encourages local brownfield development. It also reduces acid mine drainage into the Solomon’s Creek watershed. The project was funded by Pennsylvania DCED’s Business in Our Sites Program and Earth Conservancy. Pictured top left, left to right: Colleen Stutzman, Assistant Regional Director, DEP; Mike Dziak, President & CEO, Earth Conservancy; Diane Madl, Environmental Education Specialist, DCNR. Pictured bottom left: Mike Dziak, Richard Ruggiero, Sr., Property Documentation Specialist & Survey Coordinator, and John Renfer, Sr., Executive Administrator, all of Earth Conservancy. Earth Conservancy was awarded a 2010 Governor’s Award for Environmental Excellence for its Huber III Reclamation Project. The land, a former a mine waste holding area, was covered with mountainous piles of culm and coarse scrub vegetation. Now reclaimed, the site allows for expansion in the already full Hanover Industrial Estates, as well as discourages development in less conducive green areas. The project was funded by Pennsylvania DCED’s Business in Our Sites Program and Earth Conservancy. 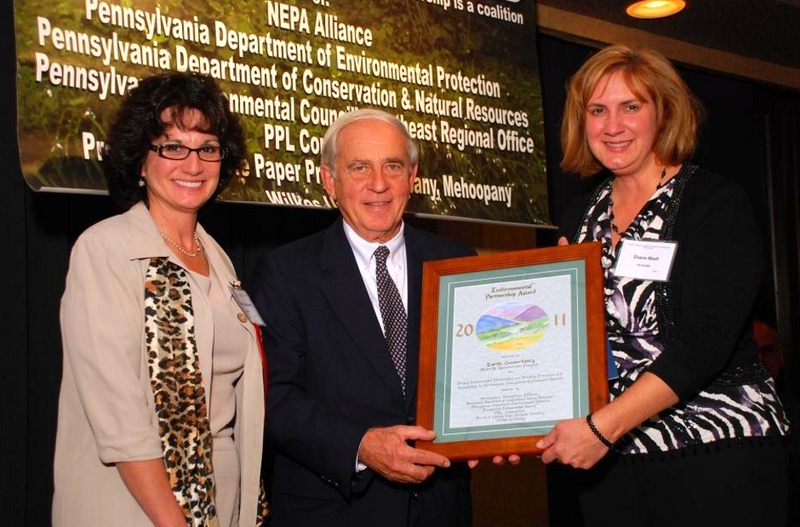 EC was awarded the EPA’s Mid-Atlantic 2009 Environmental Achievement Award for “spearheading efforts to revitalize former coal company owned lands” in Luzerne County. The Mid-Atlantic Region includes the following states: Pennsylvania, Delaware, Maryland, Virginia, West Virginia and the District of Columbia. Nine other organizations were also recognized for their environmental improvement efforts. Pictured left, left to right: William C. Early, EPA Acting Regional Adminstrator; Jacqueline Dickman, EC Director of Public Affairs & Development; Mike Dziak, EC President & CEO; John Renfer, EC Executive Administrator; and Terry Ruggles, featured speaker. In 2007, EC received a Pride of Place Award in Environmental Enhancement from the Chamber for two projects: the Greater Hanover Area Recreation Park and the Sugar Notch residential area. Both sites required extensive reclamation prior to development. 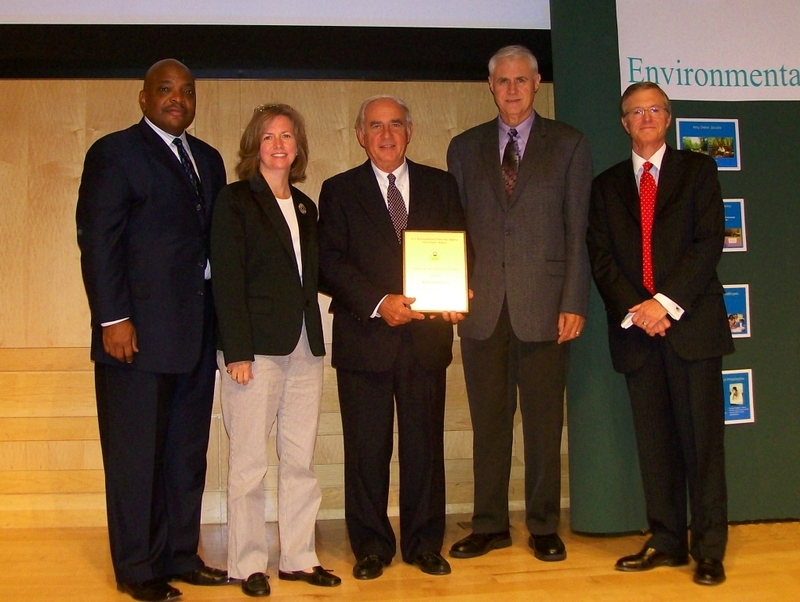 EC received a 2007 Governor’s Award for Environmental Excellence for its reclamation of the Cleveland Landfill site, which had been used for collection of debris following the 1972 Agnes Flood. 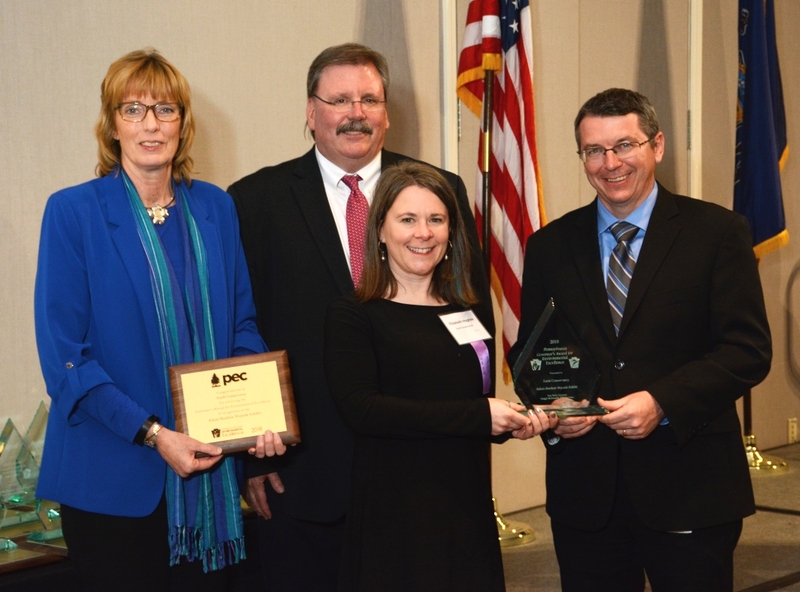 This award, sponsored by the Economic Development Council of Northeastern Pennsylvania, the Pennsylvania Environmental Council’s northeast office, Procter & Gamble Paper Products, Wilkes University, and the Northeast Pennsylvania Chapter of the World Future Society, was presented to EC for operations at its Leaf and Yard Waste Compost Facility, which serves 18 municipalities and Luzerne County residents on a donation basis. 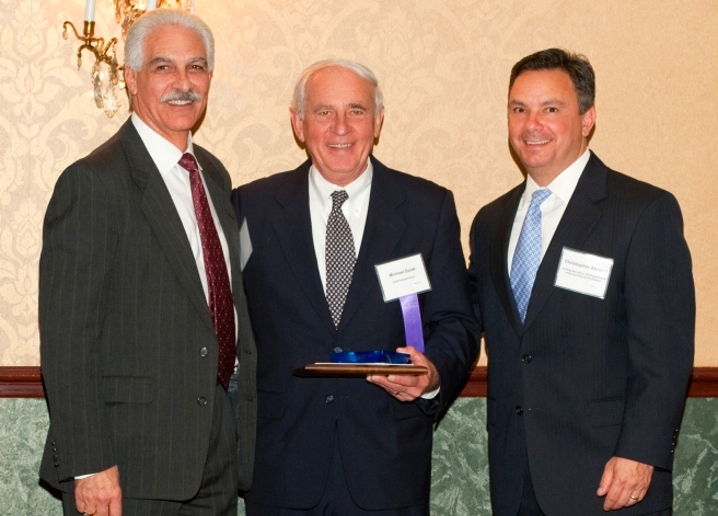 In 2002, EC and the Greater Wilkes-Barre Chamber of Business & Industry were honored with an Environmental Partnership Award for their joint effort to reclaim and redevelop a 441-acre abandoned strip mine and flood recovery landfill. The parcel eventually was transformed into the Hanover Crossings business and technology park, a concept put forward in EC’s Mixed-Use Land Development Plan, which proposed integrated residential, business, commercial, and recreational development throughout a 2,000-acre area along the S.R. 29 corridor in Nanticoke and Hanover and Newport Townships. EC received the 2002 Governor’s Award in the Land Use Category for the transformation of a former mine-scarred site into two athletic fields in Hanover Township – now the Greater Hanover Area Recreational Park. This work marked the first step in a multi-phase project of converting 63 acres of despoiled land into a recreational facility. After its completion, the site was donated to the community to oversee and maintain for public recreational use. Sponsored by the Economic Development Council of Northeastern Pennsylvania, the Northeast Office of the PA Environmental Council, Procter and Gamble Paper Products, Wilkes University, and the Northeast PA chapter of the World Future Society, was awarded to EC for developing partnerships and achieving excellence in environmental protection and resource conservation in northeastern Pennsylvania through its Land Use Plan. Sponsored by the Pennsylvania Department of Environmental Protection, the Public Recycling Officials of Pennsylvania, and the Pennsylvania Waste Industries Association, the Waste Watchers Award recognizes public and private efforts in recycling and waste reduction programs in Pennsylvania. EC received the award four out of five years for its yard and leaf waste composting operation in Newport Township, Pennsylvania. Composted material is frequently used on EC projects, including for plant establishment on our wetland projects, revegetation work on our reclamation sites, and during volunteer tree-planting initiatives. Earth Conservancy participated in Junior Achievement’s Job Shadow Program, welcoming high school students interested in environmental careers into its offices. EC staff met with students and discussed their backgrounds, job responsibilities, and requisite skills; as well as detailed EC’s mission and and its efforts in the lower Wyoming Valley. Students then toured current EC projects to view EC’s work firsthand. EC earned a second-place award from the Pocono Northeast Development Fund for its volunteer tree planting initiative, which helps reforest former mine-scarred lands in Luzerne County. Each spring, EC organizes volunteers from local schools and the community to plant seedlings on its reclaimed lands. To date, more than 1,000 children and adults have planted more than 5,000 seedlings. 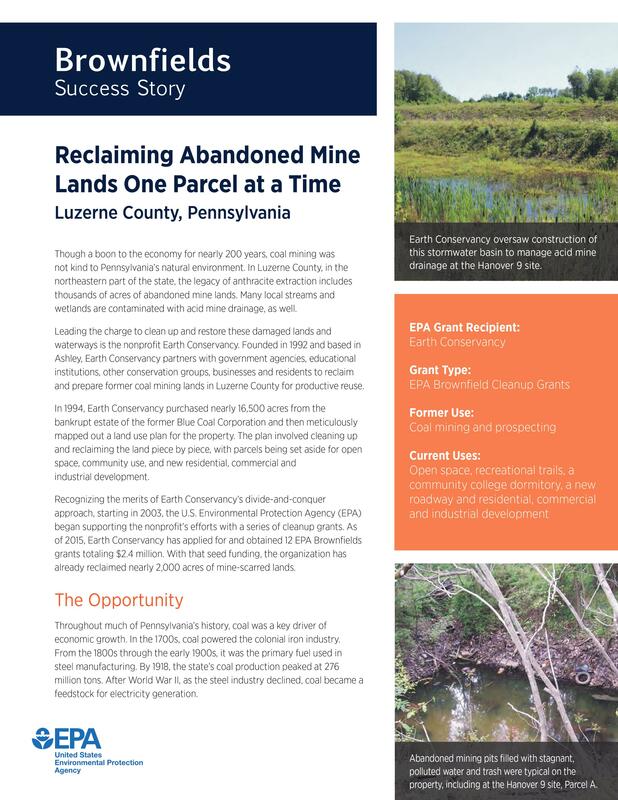 The Pocono Northeast Development Fund recognized EC in 1998 for its environmental evaluation of a 230-acre, mine-scarred and debris-filled site in Hanover Township. No contaminants exceeding hazardous levels were found; consequently, the land was suitable for development. This site was rezoned for light industrial use. A portion has been developed into a business park by the Greater Wilkes-Barre Chamber of Business & Industry. In 1998, Earth Conservancy earned its first Governor’s Award for its development of its Land Use Plan. The plan presented a long-term, comprehensive strategy for the reclamation and reuse of EC’s 16,300 non-contiguous acres, which spanned twenty municipalities in Luzerne County. Implementation began in 1997. It was estimated, at the time, the plan would take 25 years to complete. For many years, the environmental nonprofit Renew America conducted annual national searches for programs that provided innovative solutions to environmental challenges, rating selected initiatives on effectiveness, natural resource conservation, economic progress, and human development. Renew America honored Earth Conservancy’s Land Use Plan with a certificate of achievement and included it in its Environmental Success Index for Growth Management/Regional Planning. In 1996, Earth Conservancy earned a second-place award for Environmental Action from the Pocono Northeast Development Fund for the environmental and community contributions of EC’s Yard and Leaf Waste Composting Facility. Material is accepted from Luzerne County residents and municipalities free of charge, and the resulting compost is used in reclamation projects and occasional community plantings. Luzerne County presented Earth Conservancy with a Certificate of Appreciation in recognition of its support and leadership in conducting a recycling program to improve the quality of life in the region.